Summer again, and in many places, we are starting to receive news about wildfires taking place in wild, dry and lonely forests. This news are always sad, and many times very dramatic, with the loss of lives in between. It is inevitable to start thinking about ways to preventing and detecting these fires, of course besides all the prevention taken by citizens and public bodies. And it is also inevitable to think about IoT and how to apply it. After 15 years working in IoT I’ve encountered a couple of projects aiming to detect this kind of fires, and I have to say that not everything is good news. The technology enables it, but there is no clear ROI for the kind of investment needed for a proper detection system. And that is kind of sad, isn’t it? I was twenty when my parent’s house was about to be burnt down by some fire taking place in a very low mountain full of small ilexes. Anyone who has been near one of this wild fires, and I mean near as to feel the heat of the flames on his skin, will understand what I lived then. Panic. Initially, there was my own initial detection: it was the unmistakable smell. Then I run up to the roof of the house where I saw a small flame 100 meters away from the house, and the small smoke column. Warning everyone at the house, calling emergency and calming down my mother took less than 5 minutes. In those 5 minutes, the fire had expanded to a line of more than 20 meters, and the flames were more than 2 meters above the trees. Fifteen minutes after the first smelling of the smoke, the fire was half up the cliff, which was nearly 100 meters, and the flames were three stories high. The sunlight was dimmed by the dense smoke, the smell was strong and penetrating making us a cough and some ashes were falling on us. What was most frightening of all was the noise, that was like a continuous rumbling and crackle all along the mountain. But we were lucky after all because the wind was mostly perpendicular to the line of the house. This prevented us from running away, although we were already prepared with the help of the police who arrived quite soon to the place. Detecting fire in the first 5 minutes after initiated was one of the requirements set up by one of our customers. That summer, as this year, it hadn’t rained properly and drought was a reality in the news, with the authorities ordering water cuts for non-human consumption. The mild winter and lack of rains during spring had caused tree leaves to fall heavily on the floor, big amounts of dried straw and small pieces of old trees’ branched were covering the floor all around. The day of the fire there was high temperature, I’d dare to say more than 37, and very low humidity, which I don’t dare to say how much it was, but it was just one of those dry and warm days we live from time to time in the mountains surrounding Madrid. Years later, our customer set the requirements to send automated alarms when temperature, humidity and wind speed were together trespassing certain thresholds. But we didn’t have to spread these sensors all around the forest. Obviously, a single weather station, or maybe a service provided by a third party would be sufficient to be alert and to feed our processes. 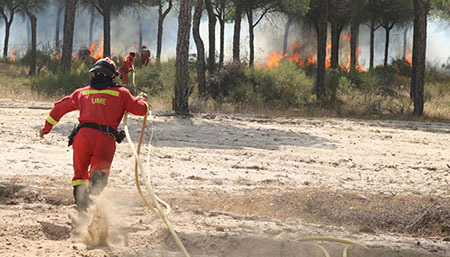 A fireman battled wildfires near Doñana Park on 25th June 2017. Because I’ve spent some time living close to the mountains, I’ve been sadly witnessing wildfires quite often. On happy years I’ve detected none. On bad years, I’ve witnessed more than five in one month in the region around the house, which is fairly big, but very small compared to medium size forest parks. Most of the times, I’ve discovered fires by their smoke, and some others after the smell. Many times also, I’ve been alerted by the noise of the firefighters’ trucks or the hydroplanes, hoping that they arrive soon enough to the place and, egotistically, that the fire was far enough from our place. Ultraviolet and Infrared: Technology is very well developed using video cameras for a long-range detection, and also using other kinds of sensors in short distances. There’s a chance that you’ve walked through a forest, stepping out of the trail, maybe looking for some adventure to find a secret place, or for a shortcut to some spot to reduce time. Whatever the case, remember the feeling of isolation you have when you are completely surrounded by trees and vegetation, preventing you from seeing where you are going, or which way you should go. Remember the absence of noise around you caused by the density of the flora. Remember the situation in which you had to follow your steps back because of an unexpected cliff, impossible to climb down, appeared in front of you. Short range sensors need visibility and proximity, which is very difficult to achieve in a place full of vegetation and full of changes in the orography. Yes, there are long range sensors, based on video analytics, that could be used. But the drawback is that they detect once the fire has a considerable length and spread, of course, depending on the distance where it is placed… which in return affects the range it covers. The biggest the size to cover, the biggest the fire has to be detected. During another project, we arrived at the conclusion that we needed a set of IR-UV-Temp-CO2 sensors every 50 square meters in order to provide a rapid response to 5 minutes since ignition. Finally, after some tests, proof of concepts and trials, the project to deploy the system in a big National Park failed to succeed. In order to cover a small sized forest, compared to the average, the costs were exasperatedly high for our stakeholders. Yes, they wanted to prevent. Yes, they wanted to invest. Yes, they wanted to innovate. But the hidden costs were exceeding the expectations and the capacity of defense of an expenditure of that kind. These hidden costs came from a number of sensors multiplied by the density and extension, plus the lack of an answer to who and how would install and maintain those sensors in steep and inaccessible places. Tough work this one. And an expensive one. Sensoring system wasn’t a problem. Communication technology wasn’t a problem. IoT wasn’t a problem and it was delivering a proper technology solution, I dare to say. But there was no business case behind it according to the available budget.